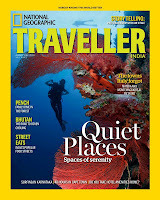 National Geographic Traveller India (Indian edition of the American magazine) was launched in India in July 2012. 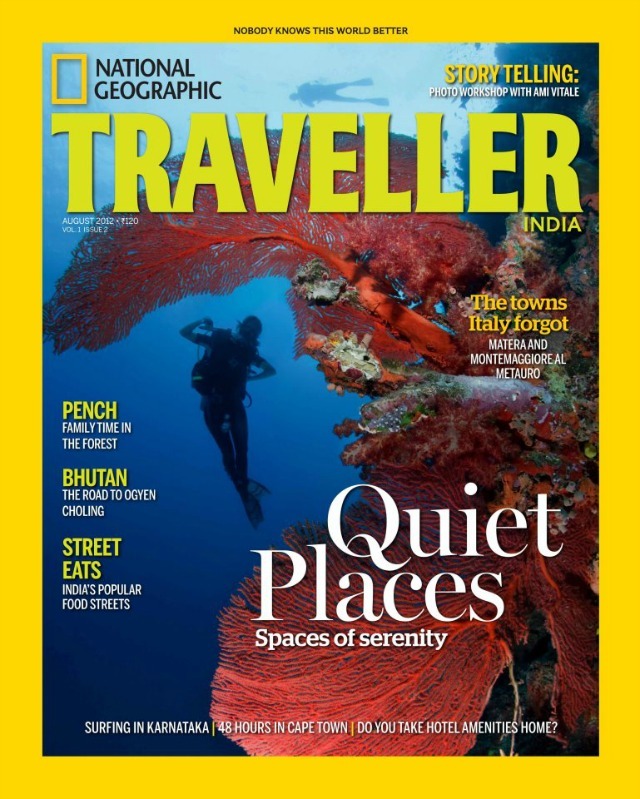 The August 2012 issue cover story is on "Quiet Places, Spaces of serenity". While skimming through the magazine, we found a page for Bengaluru/ Bangalore where there is an article on the Someshwara Temple in Ulsoor, and below this there is a mention of "4 other spots for quiet time". One of the spots named is Puttenahalli Lake! 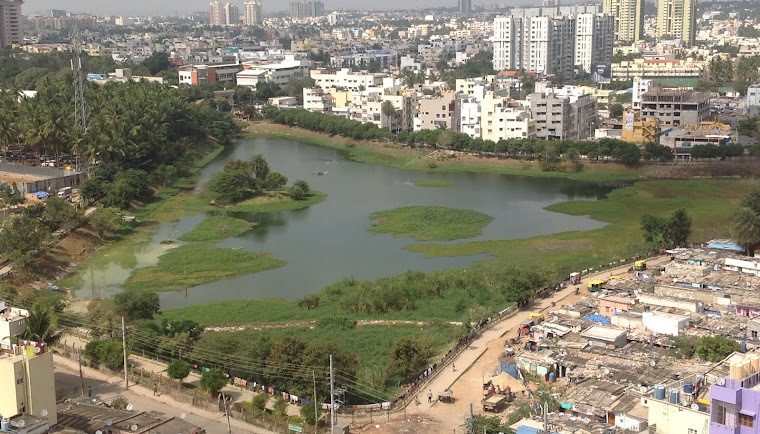 We would love to think that it is our JP Nagar Puttenahalli Lake that the editorial team means, but given that there is a Puttenahalli Lake in Yelahanka, we aren't sure. Anyway, it is a pleasant surprise to see a Bangalore lake recognised as a quiet place, alongside Cubbon Park and the Public Library, the grounds around the National Gallery of Modern Art and the IAS campus (which we think should read IISc campus where motorised vehicles have been banned recently). A recent video about Puttenahalli Lake - made by Deccan Herald. Nupur Jain, PNLIT Trustee, talks to Deepashri Varadharajan, about PNLIT, Puttenahalli Lake and the birds that have now made it their home. 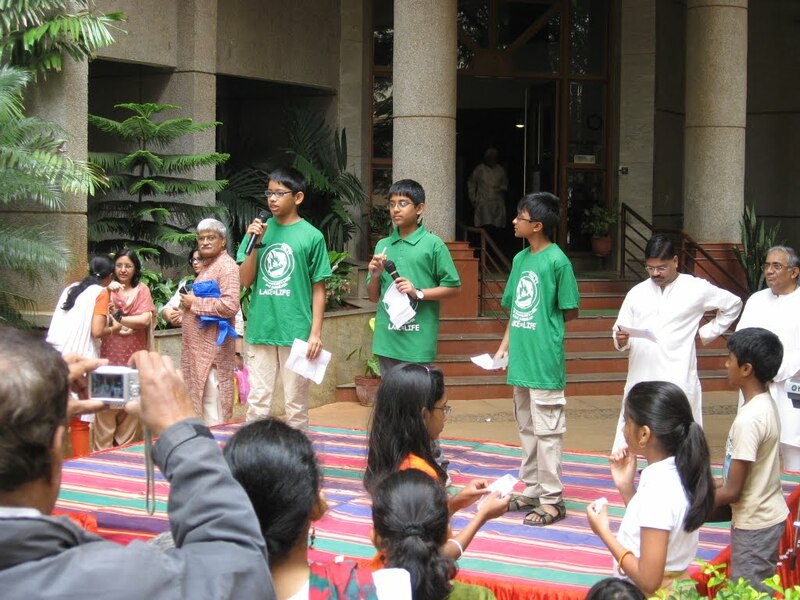 At the Independence Day celebrations at Brigade Millennium on 15th August, PNLIT Young Rangers were given a few minutes to talk to the gathering of 200-odd residents, about lakes and PNLIT. 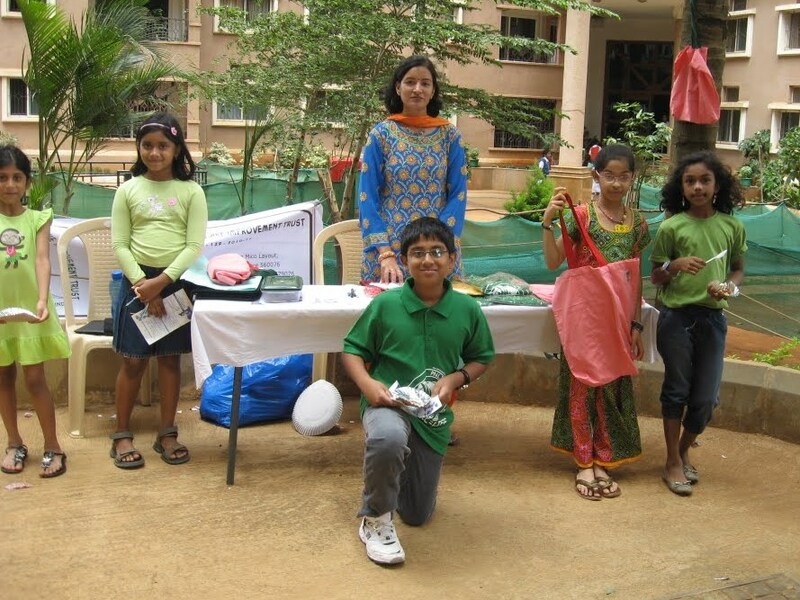 PNLIT was also given a stall where the youngsters promoted PNLIT's T-shirts, cloth bags and nature walks. Sincere thanks to the Brigade Millennium Residents Federation (BMRF) for the opportunity. PNLIT Trustee Nupur Jain, who has been guiding the Young Rangers said, "the children gave good speeches and very excitedly sold the T-shirts, bags and a nature walk". Registration for the Nature Walk is open. Details below. Time - 6:30 - 9:00 a.m. Earlier during the week, PNLIT received its new stock of cloth bags and Nupur had taken the children to the gazebo at the lake where they screen printed the PNLIT logo on to the bags. 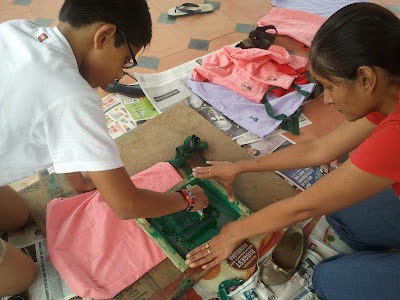 The children were thrilled to learn screen printing and enjoyed the session. More pictures by OP Ramsawamy here. 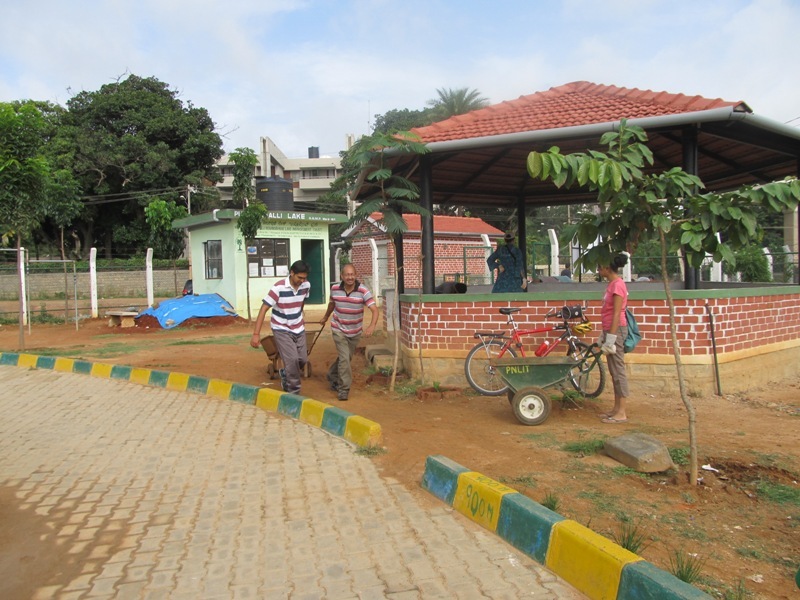 The slum residents appreciate our effort in maintaining the lake and more so that by giving them garbage bins the entrance to their houses is finally free of trash. They are deeply concerned about the increasing number of their children failing in some subject or the other and dropping out of school. 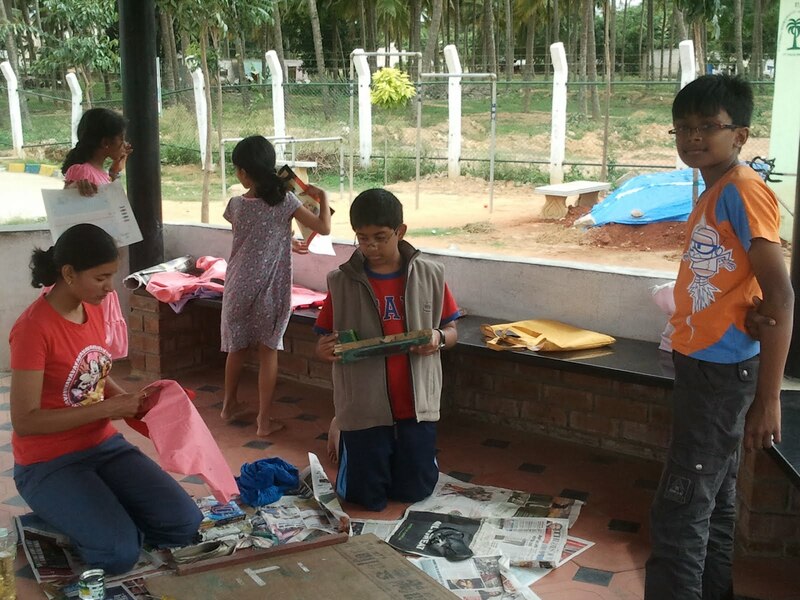 They would like us to organize tuition classes for the children. If you speak Kannada and are willing to teach any subject, any level, please email <puttenahalli.lake@gmail.com>. Just one hour of your time will make a big difference to them and their children. The classes can be conducted in the gazebo at the lake. 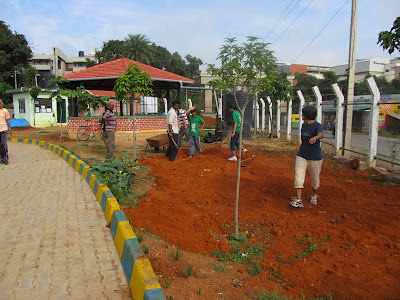 A meeting of lake teams in Bangalore was organised by Arekere Neighbourhood Improvement Trust (ANIT) together with OneBengaluru on 5th Aug 2012. The meeting was well attended by more than 125 people from 20-odd different lake teams including PNLIT trustees and volunteers - Usha, Nupur, Sapana, Vijay, Vivek, Prajna, Vishnu, Siddharth and Mihir. Directly after the meeting, a team of some 10 people from Kaggadasapura Lake in East Bangalore visited Puttenahalli Lake. 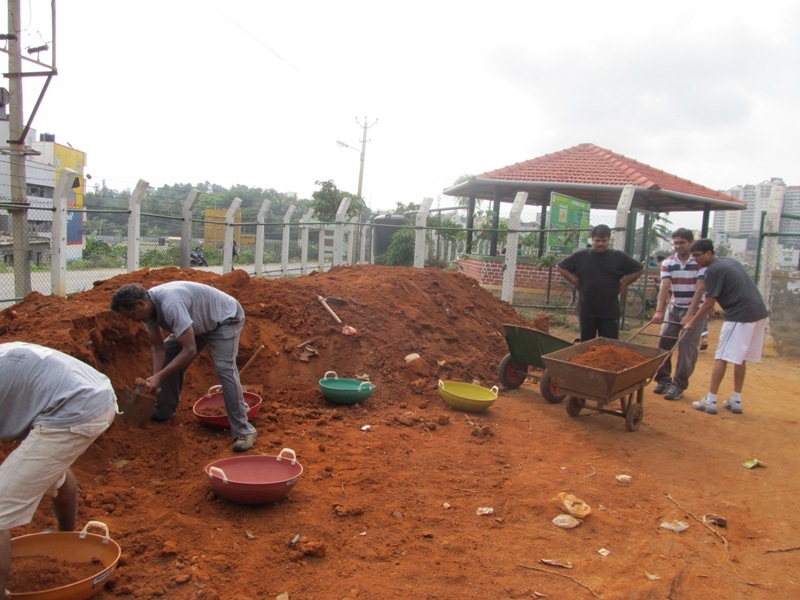 They are keen on leveraging our experiences at Puttenahalli Lake to conserve their neighbourhood lake. Below is a report of the meeting by Dr Arbind Gupta, chairperson of ANIT. 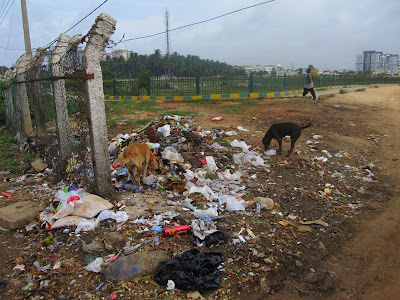 Report in The Times of India "City lakes are your responsibility" here. A meeting of different lake teams in Bangalore was organized by Arakere Neighbourhood Improvement Trust (ANIT), together with OneBengaluru, Citizen Action Forum (CAF) and different lake teams. 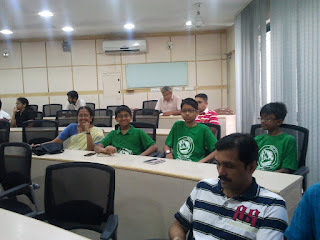 It was attended by more than 125 people from about twenty different lake teams across Bangalore. The objective of the meeting was to bring Govt and different lake teams together to leverage the strength of each other and to bring synergy of operation. Mr Purushotam Ravi, Corporator of Arakere area. Dr Arbind Kumar Gupta, chairperson ANIT, set the agenda of the meeting by giving a background of how the idea for bringing different lake teams came about. He also spoke about the concept of NEW INDIA as an enlightened group of citizens who do not remain a bystander but choose to become a stake holder by taking part in finding solutions to these problems. Dr Ashwin Mahesh highlighted the need for citizens to participate in public problem solving and begin with small activities. He talked about how each small activity of collecting / documenting lake info by public can help in evolving a solution and build the infrastructure and setup required to solve the problem. Later on, he also spoke about the idea of creating a platform, a good part of which is available in bcity.com that can be leveraged for this purpose. Dr Ravi Ralph talked about the various challenges faced by different lakes in the city. He was very clear that encroachment of lakes and destruction of catchment areas of lakes is causing havoc to the health and conditions of lake. He also talked about the roles and responsibility of LDA in Bangalore as an approving, monitoring and supervising agency, while the actual responsibility of lake development lies with BBMP and BDA. He highlighted the heavy contamination of lakes that cannot support even aquatic life. Mr Brijesh talked about the draft policy that BBMP is coming up as a model for partnership with public. He explained the concept of Lake User Association (LUA) as a group of local residents of a lake, taking responsibility of maintenance and upkeep of lakes. He also talked about the source of fund required for maintenance and the fact that BBMP is considering about providing a part of the fund for maintenance of lake. Mr Mukunda brought out two key points about the development of lakes. First is to know the topological structure of lakes that provides for natural connectivity of water flow between lakes. He requested different lake teams to walk around the path of upstream and downstream lakes and collect this information. He was also of the opinion that the only solution for maintaining lakes was to vest this responsibility with Govt agencies, in partnership with lake teams. He brought out the difficulty in sustaining lake maintenance if this is to be done by local residents only. He said that lakes are the only solutions to water problem of Bangalore and it can help bring ground water to within 200ft. Mr Somesh also shared about the plan of development of lakes in South Bangalore and he talked about various steps being taken by BDA in this direction. It was suggested that providing information about various responsibility about lake upkeep will help local residents in supporting Govt agencies. Notice of the meeting here. 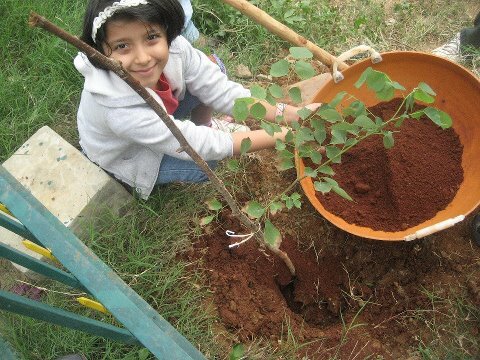 Shreya Sharma recently planted two saplings at Puttenahalli Lake, to commemorate her seventh birthday. Shreya's dad Munish Sharma, resident of the JP Nagar neighbourhood Brigade Gardenia Apartments, has "adopted" the saplings for a year. 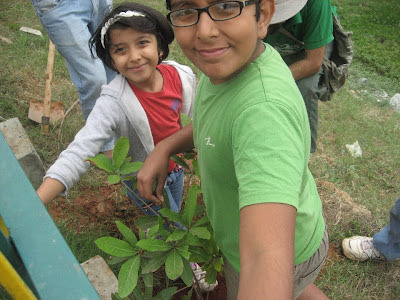 With careful nurturing, the saplings should have grown considerably by Shreya's next birthday. If everyone planted a sapling on her/ his birthday, we would have a billion trees in India every year! Whether a human being or a tree, how little we value the aged never realizing the good in them. Just outside our Puttenahalli Lake is a tall tree which had leaves growing on branches too high up to identify what species it belonged to. The branch formation gave no clue either. Perhaps it was deciduous because sometimes only the twigs remained criss-crossing in interesting formations against the sky. Ever since PNLIT assumed charge of maintaining the lake, we noticed the fellow looming outside the lake because, come evening, flocks of birds like Rosy Pastors would fly from the lake and sit on its branches. After a while they would fly away unlike the Barbets, Woodpeckers, Grey headed Mynas, Parakeets and Shikra among others that nested or fed off the old tree. Our PNLIT Shutterbugs spent as much time clicking the birds as they did the water birds. Photographs can be seen on our website. 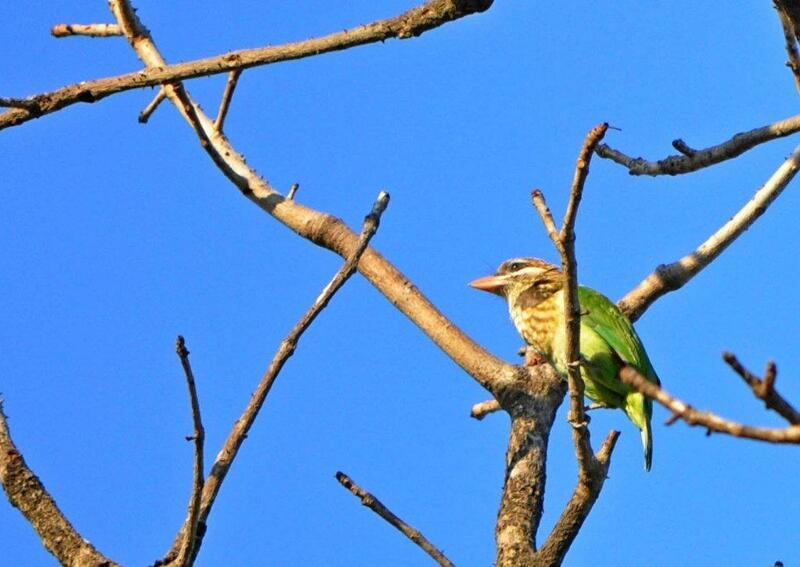 White-cheeked Barbet Pic: Sujesh S.
Coppersmith Barbets Pic: Sujesh S.
Today at about 1.30 p.m., one of our volunteers driving past noticed some men cutting down the tree. 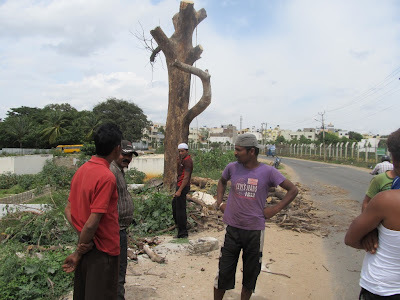 She alerted us and we rang up our gardener to find out who was cutting it down while we tried to contact the BBMP. One of the men called back to ask if the tree was to be cut down or left standing. We told him firmly not to chop it and rushed to the site. Just as we reached the spot, however, it came crashing down. Apparently, the men had instructions from the Forest Dept. to cut down dead trees in order to prevent them from falling on people and vehicles. A very valid reason indeed except that our tree would not have been a threat to anyone. It stood by the roadside but generations of tree cutters had lopped off all the branches that would have hung over the road. Behind the tree was a steep slope with a profusion of weeds and no building anywhere near. Where was the danger of anyone getting hurt? Without considering these, the men sliced it with an electric saw. In one swift stroke, they have driven all the birds to seek another resting place, another food source in an increasingly hostile city. Shouldn't the Forest Department identify the ones that could pose a threat and leave the others alone? Shouldn't they know that even a "dead" tree supports a large number of life forms? 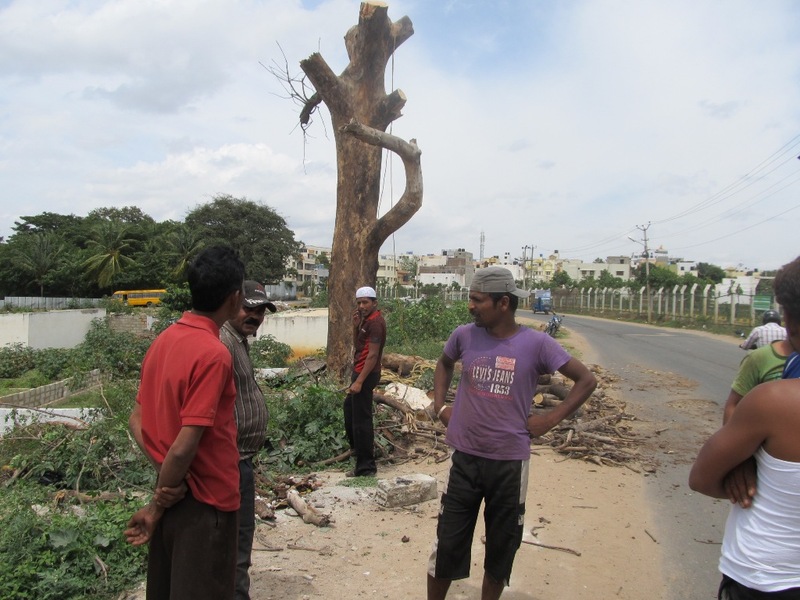 Seshadri, the man who led the cutters team, dismissed any suggestion of birds nesting in the tree. He reported to his superior officer in the Forest Dept. 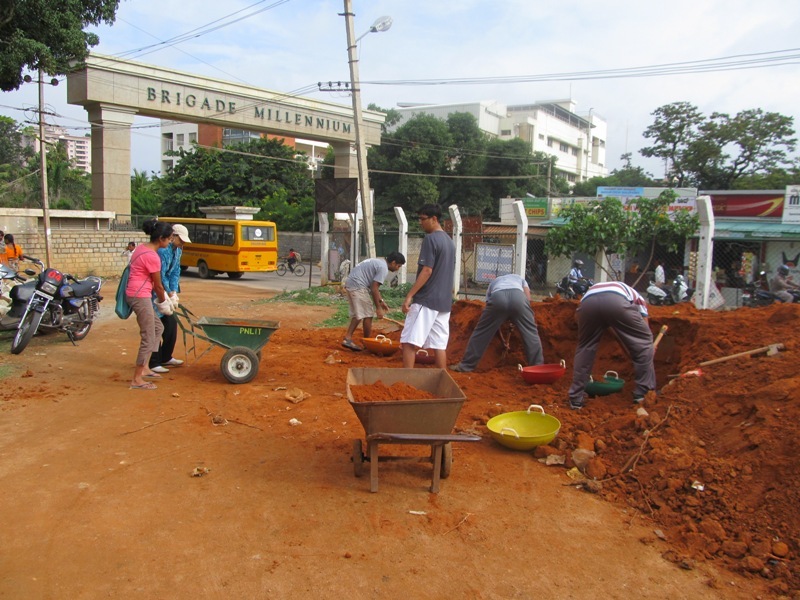 Mr. Vijay Kumar, that we were getting agitated for nothing, that there were no nests in the tree, only a few holes! 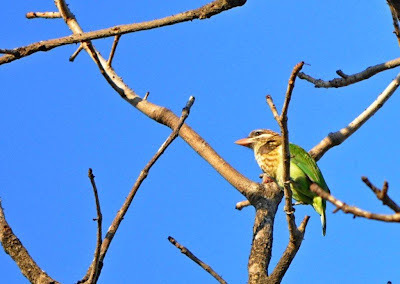 Last Saturday we met a bird watcher at the lake who narrated how one particular hole in a dead tree became the home of three bird species one after another - a White Cheeked Barbet, a Parakeet and an Owlet. This is not unusual. Birds do not always build nests with twigs and leaves. They also drill holes or move into existing ones. 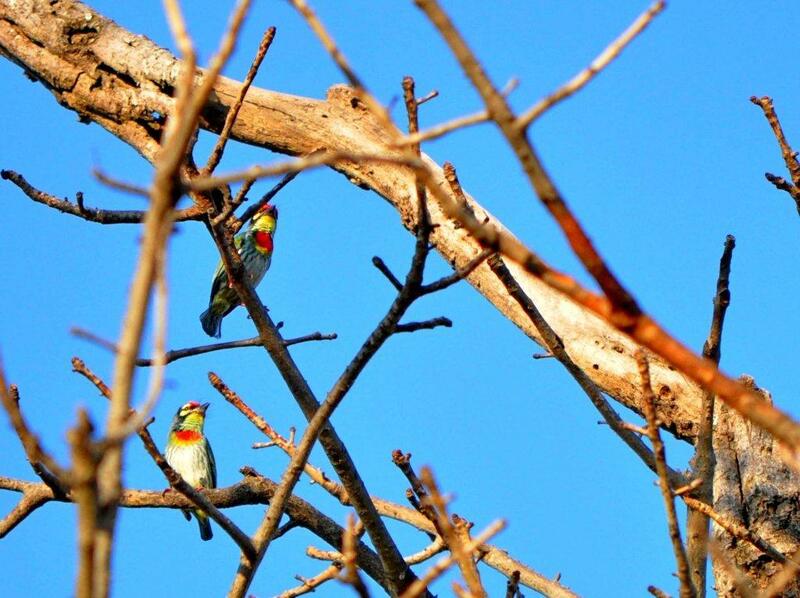 The Indian Environment Portal says that " In India, 120 species of tree-cavity nesting birds have been identified but very little information is available about their breeding habits." The portal also says, "About 10% of the world's bird species are on the verge of extinction, threatened by trapping and tree felling." Early last month the Chief Conservator of Forests, Mr. Brijesh Kumar had visited the lake and we had pointed out the tree to him asking if we could officially adopt it. 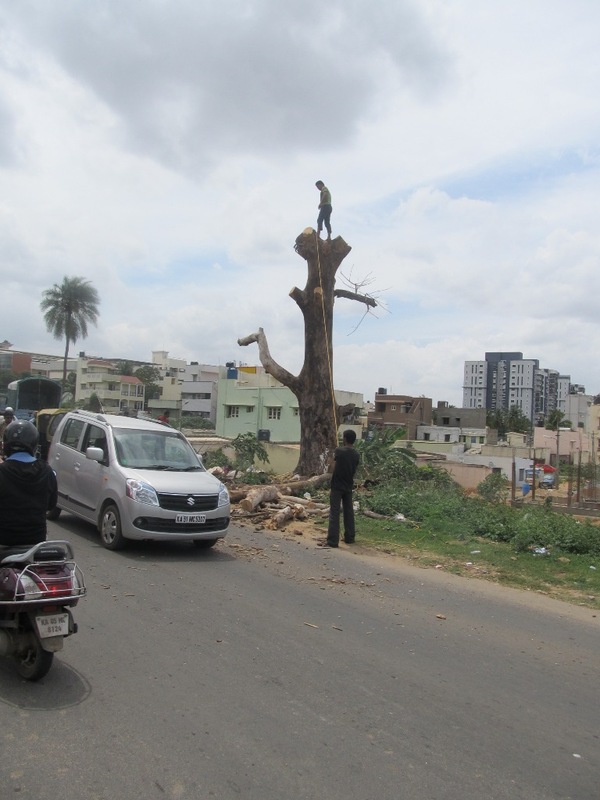 He had laughed and said, "Unfortunately, we are not approached for permission to cut down a dead tree." How we wish we had followed it up with him and found if somehow or the other we could adopt the tree. Would a ring of green paint around the trunk have protected it from the killing bite of an electric saw? 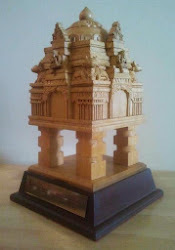 We could not save the branches but, on our insistence, Seshadri and his men have left the trunk alone. Will it become a home to any bird? If another team of ignorant do-gooders hold back their saw, time will tell.